traditional 10T containerized plant. They are typically planted on 6-9” centers into 6” of good soil and fill in over the course of 1 - 2 growing seasons. 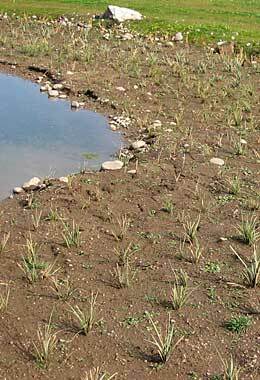 We currently offer bare root plants in bulrush, sedge, spike rush and rush species. With enough lead time we can custom grow bare root plants to address specific plant source needs. Dimensions: Equivalent to a 10 cubic inch containerized plant.